Happy Superbowl Sunday my nail art loving beauties! As I sit here with the hubs watching the game (and by watching, I mean only tuning in for the commercials and any dramatic interviews/celeb-spotting) I decided to collect the top three nail art looks I rocked this winter to share with you. 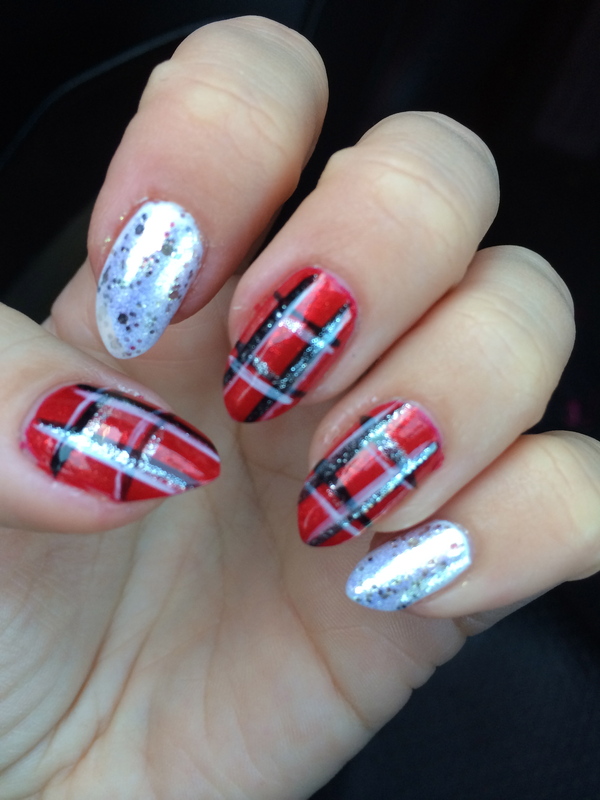 Plaid nail art looks harder than solving a Rubix cube but is actually very easy to do. 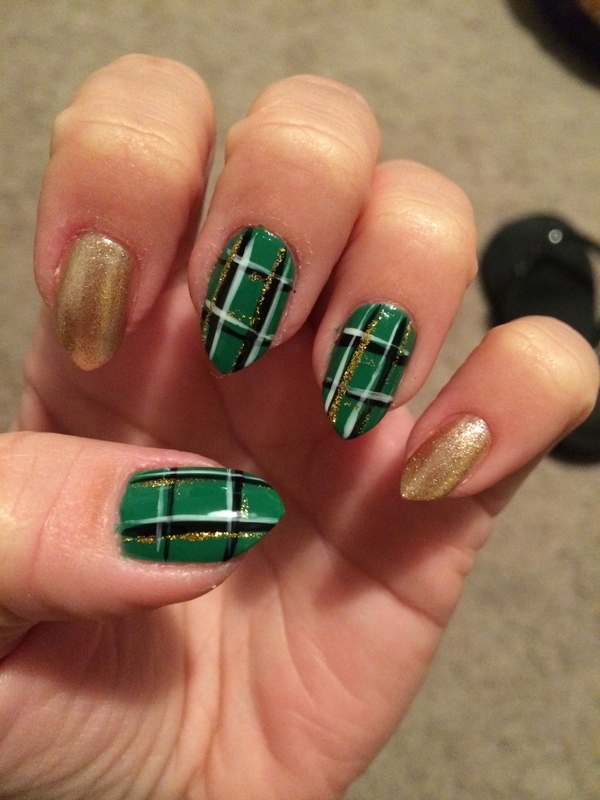 I painted two of the nails on each hand with a shimmery frosty gold, leaving me three on each hand to plaid out. 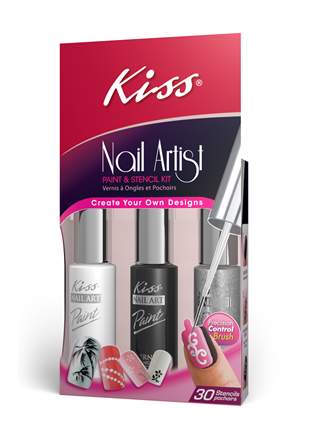 All you need is a base color (I picked Sheswai’s Dig It shade), a white striper, a black striper, and an optional glitter striper (I bought the Kiss trio stripers from CVS- inexpensive!). I start with the white striper, two lines vertical and two lines horizontal. Then I repeat that step with the black, then with the glitter. Apply a fast-drying top coat and you are dunzo. For Christmas, I did the same design but with red and white. I topped the white polish with my new favorite polish from Essie called Hors D’oeuvres, which I can only describe as a sheer platinum gold with different-sized silver iridescent glitter flecks. It’s delicious! And lastly, my mom-in-law (or mom OUT-law, as she likes to call herself) bought me these Ciate Rose Gold Caviar beads for Christmas. I am absolutely in LOVE with these little beads! Mine lasted a full 7 days, but you have to follow my tips below to keep yours on that long! 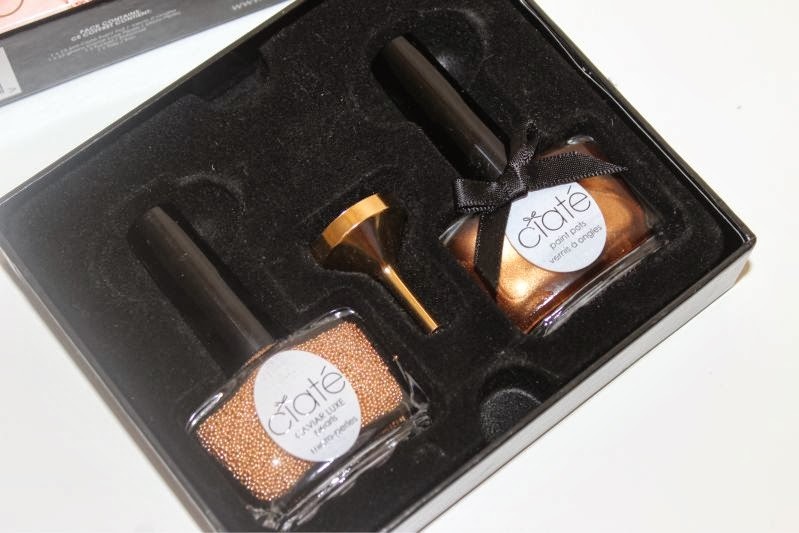 I suggest sprinkling the beads onto your nail immediately after you apply the second coat of the gold polish. This will allow you some time to gently shuffle the beads around and sprinkle more on the “bald spots” before everything dries. The directions say not to apply top coat, but in my experience, you absolutely NEED to. If you don’t wear a top coat, every bead will fall off before you can click on that article about Justin Beiber getting arrested. 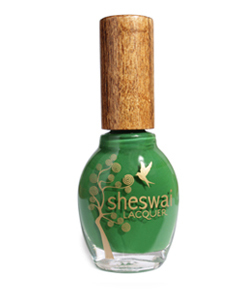 Give your caviar-beaded nail about 1-2 minutes drying time before absolutely drenching your nail in clear top coat. Make sure it gets in all the nook and crannies. 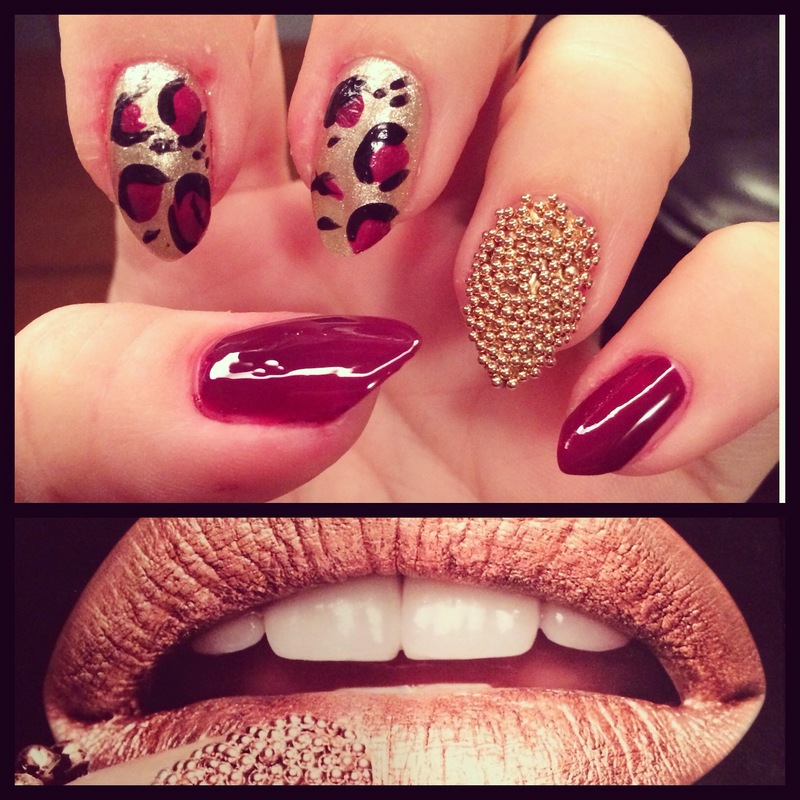 I also recommend doing the caviar beads on a nail that you don’t use that often. If you choose to do your index fingers for example, the beads will chip off much faster, because you will be cracking soda cans open and scratching. I chose to do the ring fingers, but the middle fingers are also a good option. How cute is that rose gold funnel?! It’s so convenient- I used the clear plastic cover of the box as a tray to catch all the loose beads, then I poured them back into the bottle with the funnel so I can use them for next time. Genius!